We can't contain what we've experienced in Jesus. We can't help but tell about what we've heard. 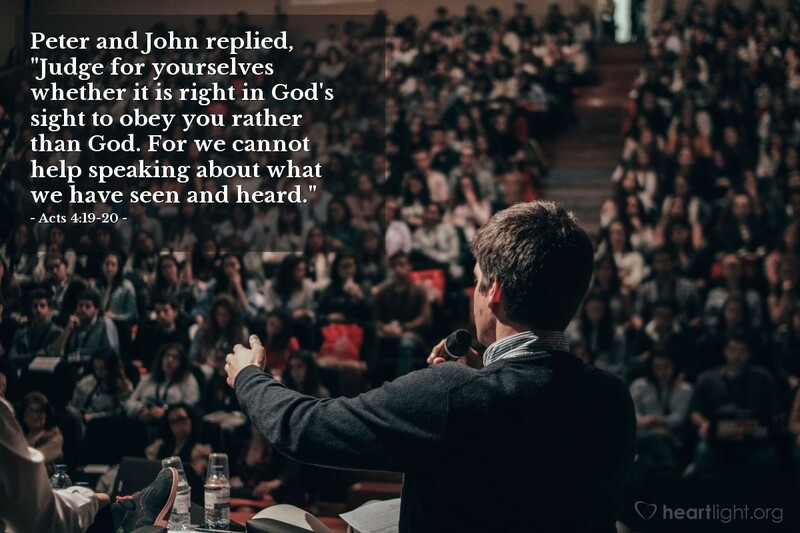 No ruler, no threat, has been able to completely stop the voice of God from being heard through his people's witness. Sharing our faith happens out of the overflow of our experiences in Christ and our relationship with Christ. When we share our faith in this way, the authenticity of our witness can be rejected or ridiculed, but it can't be erased. We have experienced God's work in our lives. How dare we keep silent? We can't! God of the nations, please give your missionaries and ministers words of truth and power, especially as they face ridicule and hostility. Please help me better know how to reach the lost around me and please bless our evangelistic leaders as they try to strategize and discern your way of reaching the lost in our world today. In the name of Jesus, the atoning sacrifice for my sins, and the sins of the whole world, I pray. Amen.